Tom Nichols has signed for Posh from Exeter. Peterborough United have today (February 1) completed the signing of Exeter City striker Tom Nichols for an undisclosed fee. Nichols (22) has scored 12 goals for the League Two side this season, including one against Liverpool in the FA Cup. He has signed a four-and-a-half year contract at the ABAX Stadium. Luke James has moved back to Hartlepool on loan. Nichols is the sixth Posh signing of the January transfer window after Shaquile Coulthirst, Adil Naba, Aaron Williams, Callum Chettle and Harry Toffolo (loan). Posh also signed Jordan Nicholson from Histon in December. Nichols was left out of Exeter’s League Two win at Hartlepool on Saturday (January 30) to protect his move to Posh. Nichols has been at Exeter for his entire career so far. He’s scored 35 goals in 122 appearances, but 47 of those appearances have been from the substitutes’ bench. Posh striker Luke James has moved on loan to Hartlepool for the rest of this season after a similar deal at Bradford City was aborted. Local Stevenage media are claiming Posh have agreed a fee for their midfielder Dean Parrett, but that personal terms have not been agreed. Posh boss Graham Westley signed Parrett for Stevenage from Spurs. Parrett (24) was a second-half substitute for Stevenage at the weekend, He hasn’t started a game since November. 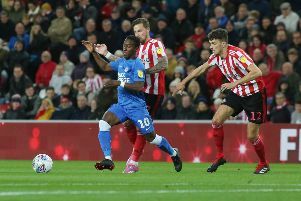 Posh are known to want to shed players from what is now a bloated squad and first-team regulars are understood to be targets for higher-level clubs. Attacking midfielder Marcus Maddison is a target for Championship side Leeds United. He’s wanted by manager Steve Evans, but the club have yet to come up with an acceptable offer for the 22 year-old. Rumours have again surfaced linking Premier League Bournemouth with a move for Posh centre-back Jack Baldwin. The Cherries had a £2 million bid for the 22 year-old rejected after he starred in Posh’s League One play-off semi-final defeat by Leyton Orient in May 2014. If Bournemouth did move for Baldwin they could possibly be persuaded to loan him back to the ABAX Stadium for the rest of the season. Baldwin has made just 32 appearances for Posh since moving from Hartlepool for £500,000 in January 2014. He was absent for 14 months because of knee ligament damage. Posh could also try and unload some of their younger players on loan today. Left-back Kgosi Ntlhe is available for transfer after refusing to sign a new contract offer.